Today's "Daily Disciplines" post isn't about a specific discipline, but it's about how to implement many of the disciplines that we've talked about and more. If you're struggling with consistently doing something, one idea would be to lay aside a small amount of time each day to do that task, starting small and perhaps building up as you maintain consistency. Many daily disciplines really don't take that much time, when it comes down to actually doing them! After the post on exercise last week, I really wanted to implement a specific time each day to stretch and practice different exercises or dance steps that needed work. I had often wanted to before, but simply never got around to it, because I didn't have the 30 minutes to an hour I thought I should spend on it. So, I decided to take just 15 minutes out of each day, and work from there. So far, it's gone really well! It's easy to fit 15 minutes of exercise in my room into my afternoons, and I enjoy the energy exercise gives in the midst of otherwise sleepy-feeling afternoons of homework. Another plus is that these 15 minute increments give me time to listen to music, something I'd really begun to miss. At home, I'd listen to classical or praise CDs or the radio while doing chores, cooking, driving from place to place, or playing games with family. Here at college, I was finding that I'd go for days without turning anything on, and my spirits were beginning to suffer as a result. I prefer absolute quiet when I study or read, and I rarely drive anywhere except for church on Sundays, so there weren't many times I could listen to music. So, I take 15 minutes and turn on an uplifting CD and enjoy listening to the beautiful music and praising God from my heart as I do plies, crunches, turn-out exercises, or stretches. And, at the end, I let myself just move, forgetting anything rehearsed, and simply praising God with dance. It encourages my spirit, and helps me accomplish needed exercises! 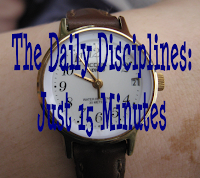 What can you take 15 minutes and commit to doing each day? Great post! I know that one of "Fly Lady's" sayings is "You can do anything for 15 minutes!" Thanks for this reminder! 15 minutes can truly do a lot! I have been taking the first 10-15 minutes each morning to do light exercises (jumping jacks, sit ups, etc). I fill much better the rest of the day when I do this. By the way, I moved my blog. Come see me at http://darelinagreen.wordpress.com/. Love to see you there.